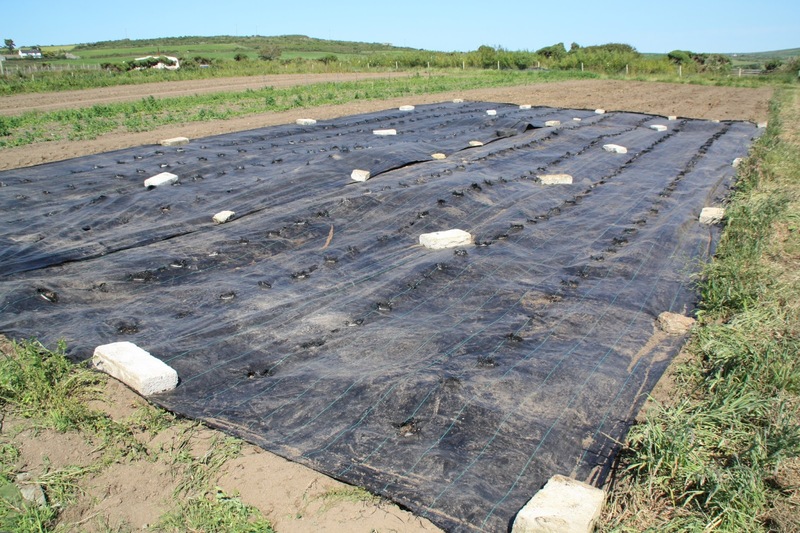 The final third of our new outdoor salad bed has been the best so far, with few flea-beetle holes, few weeds, and lots of salad leaves (which also enjoyed the recent rain). Our outdoor salad bed with its three successions - the first bed covered on the right getting ready for re-sowing, the central bed with its old salad, and the bed on the left with its fresh young salad just ready for its first pick. 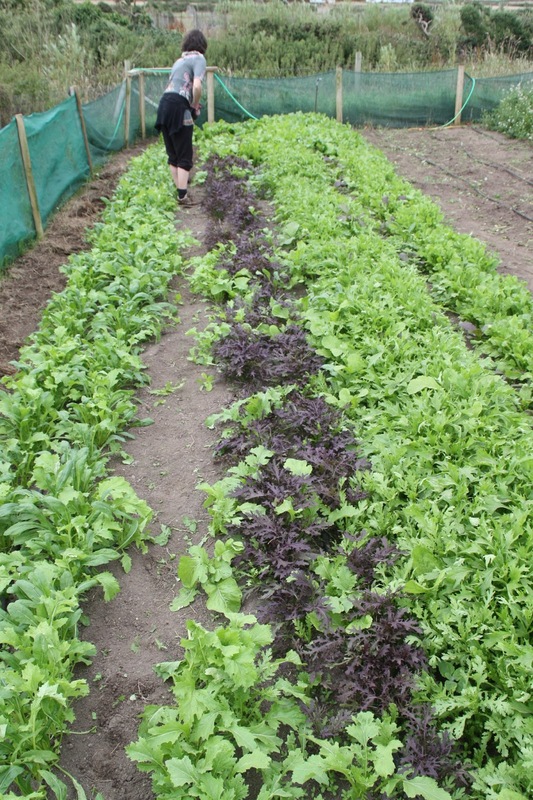 Alice hoeing paths in the new salad - red frills, rocket, mizuna, mibuna and sessantina. 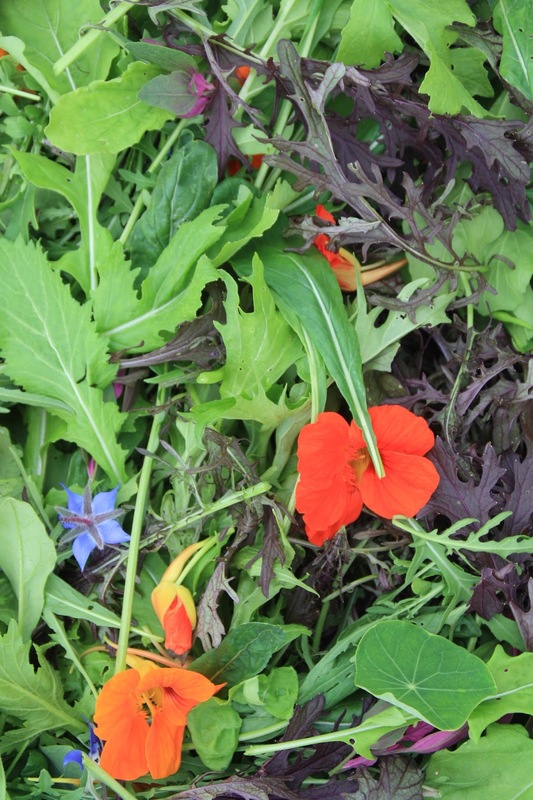 A mix of the new salad, supplemented with borage flowers from the market garden, plus nasturtium flowers and leaves plus wild rocket from the polytunnels. 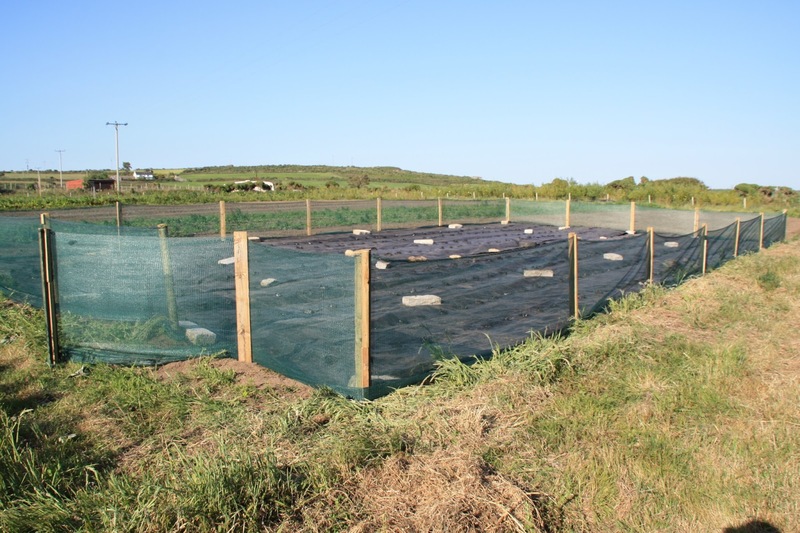 This year we have hugely increased our fruit output from the farm, mainly thanks to our new fruit-cage. 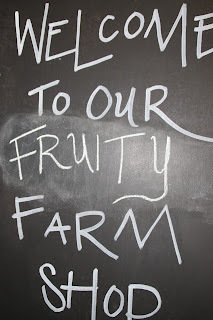 This week we harvested our first blackcurrants, redcurrants, and gooseberries from it. 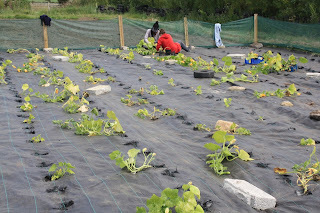 We also have a big area of outdoor rhubarb, plus both strawberries and physallis (Cape gooseberries) from the polytunnels. 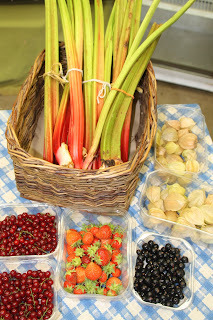 These are all now available in the farm shop if you are lucky enough to catch them (they sell out fast!). Our rhubarb and strawberries have almost finished for the season, but the physallis and currants are just starting, and we also have tayberries to come. On Tuesday 21st and Wednesday 22nd July we planted more than 3000 brassicas, which is most but not all of our brassicas for this autumn and winter. Thanks to our propagation tunnel erected in March, we were able to raise all these seedlings ourselves this year. We still have some seedlings growing on to be planted in August, and we will need to supplement (by buying in) what didn't work out, but it was a big leap for us and generally successful. 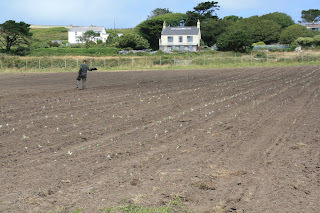 The brassicas (kales, cabbages, Brussels sprouts, cauliflowers, calabrese, and broccoli) were planted in the old chicken field, where our birds had pecked around and manured for 2 years, after which we ploughed, harrowed/rotovated and limed it. 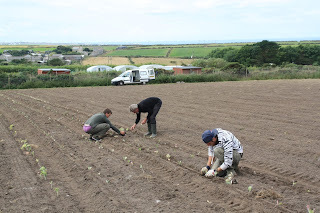 Pablo, Doug and Giordano pushing in seedlings after the tractor has passed. Pablo filling a few gaps in the almost completed field. 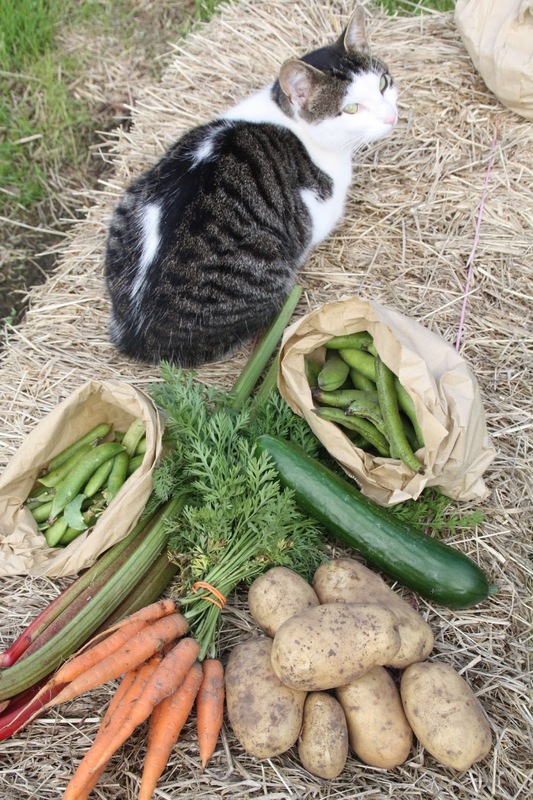 Our small £6 veg box from Friday (cat not included - Boss just likes being in photos) contained a bunch of baby carrots, rhubarb, peas in their pods, new potatoes, broad beans and a cucumber. 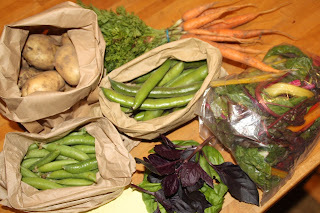 The standard £10 veg box also contained a bag of salad leaves, fresh basil, Swiss chard, and extra potatoes. 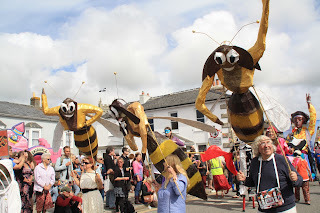 Lafrowda and the Bosavern Bee-Gees. Another year's Lafrowda festival is over, with yesterday being the main day, and it was as excellent as always. 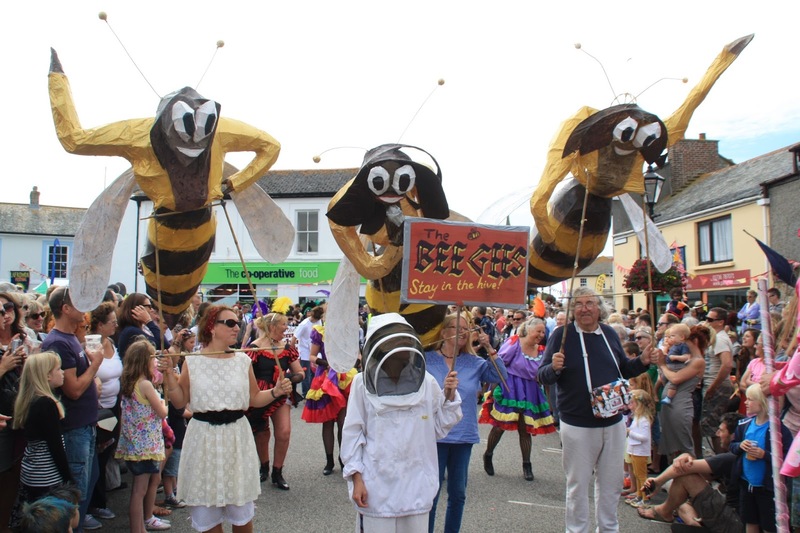 Bosavern Community Farm again took part in the community procession on finale day (but we opted against having a stall on Fore Street this year - there's only so much you can do), following up last year's hilarious Were-Rabbit with this year's pun-tastic Bee-Gees. 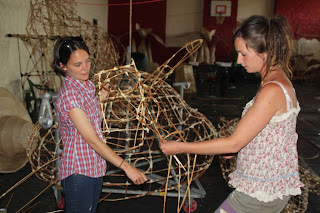 Alice and Nikki starting the Bee-Gees at one of the willow workshop sessions in the Drill Hall. 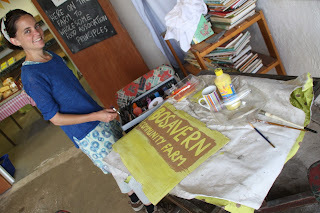 Alice making our sign whilst staffing the farm shop. 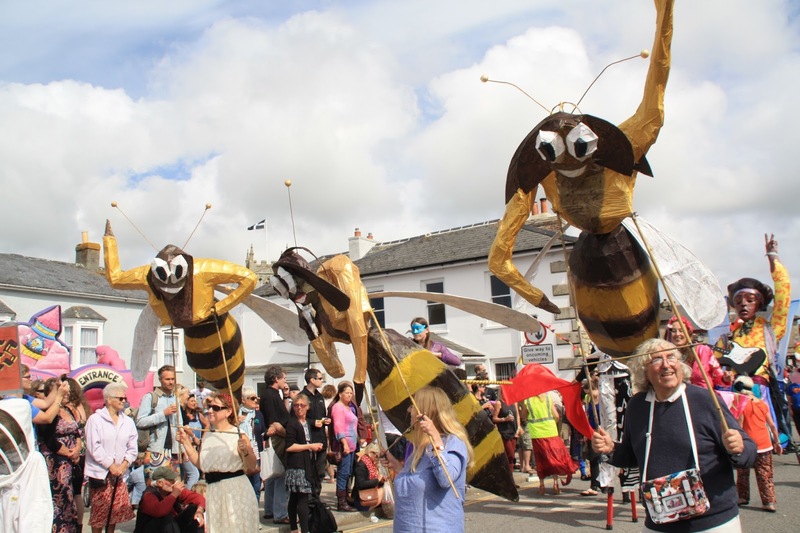 Deb, Alice, Sue and Ian parading through a packed Market Square in St Just. 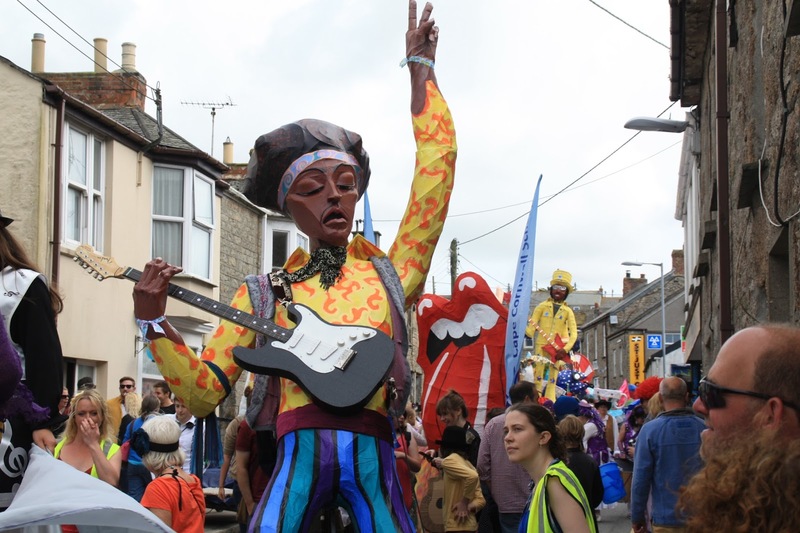 The Community Procession coming back down Fore Street, with Jimi Hendrix, The Rolling Stones, and Bootsy. Heading through Bank Square one final time. We would like to thank Alice, Nikki, Jo, Liz, Jenny, Andrew, Jim, Mel and Helen for creating the amazing Bee Gees; Deb, Sue and Ian for carrying them in the procession; and to the whole Lafrowda crew for another superb festival. 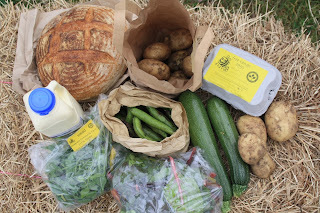 Last Friday's standard £10 veg box is pictured above, and contained new potatoes, peas in their pods, Swiss chard, physallis (a.k.a. Cape gooseberry), climbing French beans, broad beans, mixed basil, a cucumber, two rocoto chillies, and two courgettes (one of these in this picture is a patty-pan squash). 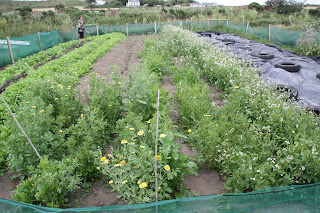 The small £6 box contained new potatoes, peas in their pods, broad beans, Swiss chard, a cucumber, and mixed salad leaves. Please contact the farm on 788454 if you would like to join our scheme! 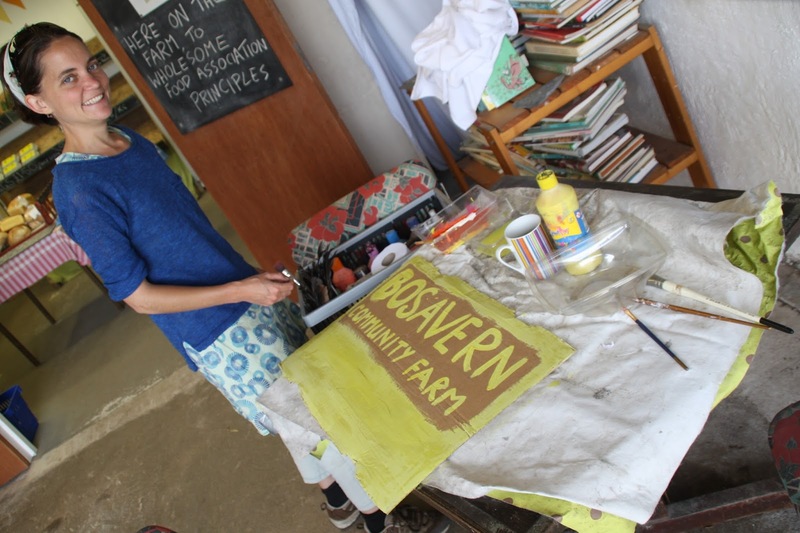 Jonas, from France, left the farm earlier in the week after 2 weeks volunteering with us, to head to his next wwoofing destination, and we thank him for his work during his time with us, and wish him all the best in his onward travels. 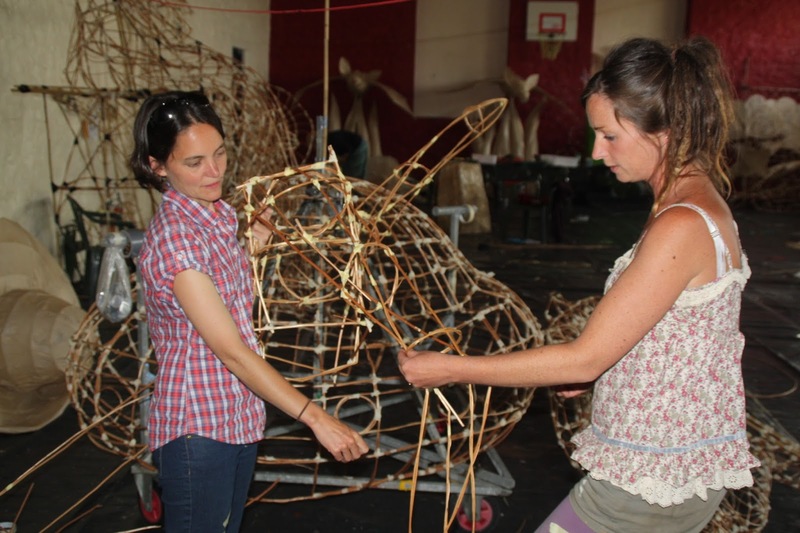 Alice and Sarah, from France, left the farm yesterday morning after wwoofing with us for 2 weeks. 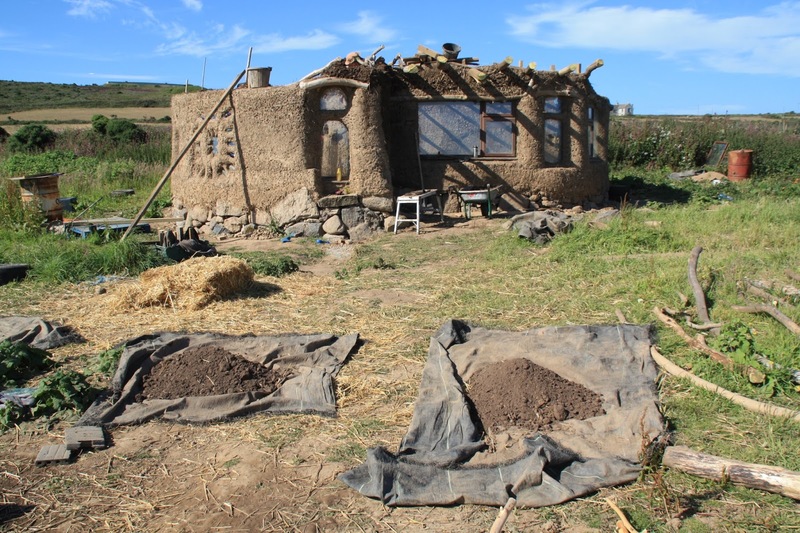 Thank you both for your work on the farm, and good luck with your onward farming experiences. 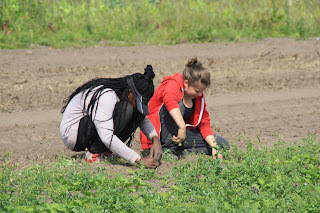 Alice and Sarah weeding lines of parsnips in the market garden. 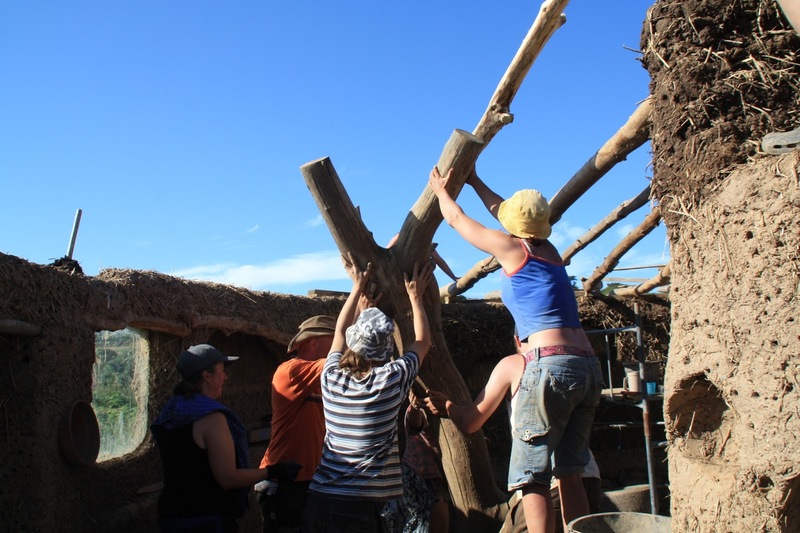 Jo and her team of cobbers, joined by several local volunteers, returned to the farm last week to put in another eight days of work on the cob build. 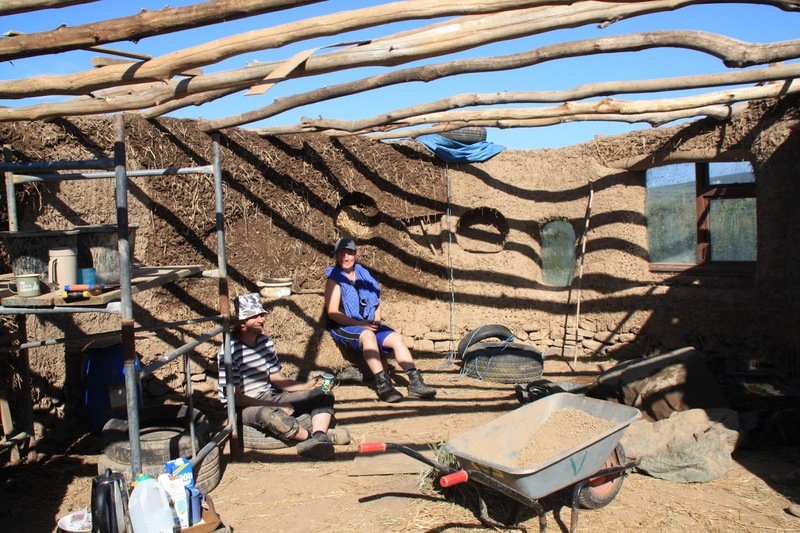 All the walls are now complete, plus the door-frame, and most of the rafters are in place, leaving the roof to be put on in phase 3 (dates to be arranged). The cob round-house towards the end of phase 2. Lifting the central pillar into place on day 24. 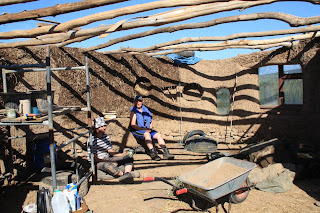 Relaxing inside the round-house before tidying tools away. 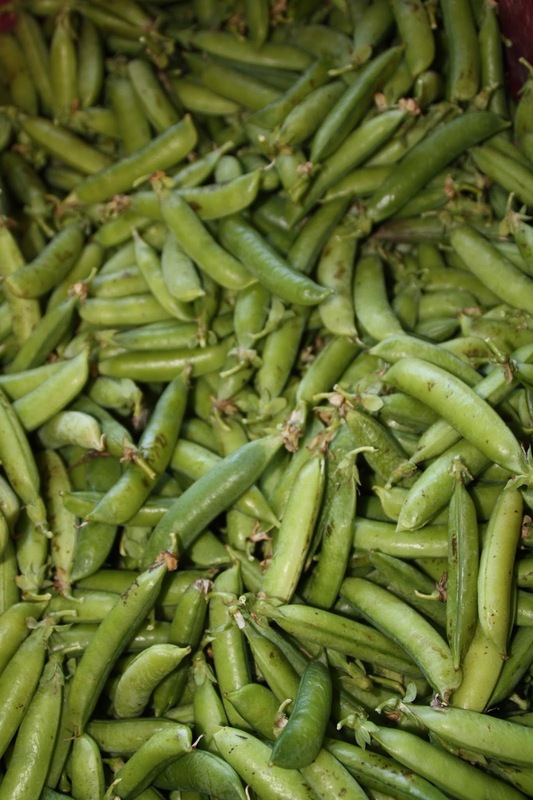 This week was our first harvest of peas of 2015, yielding over 8kg. 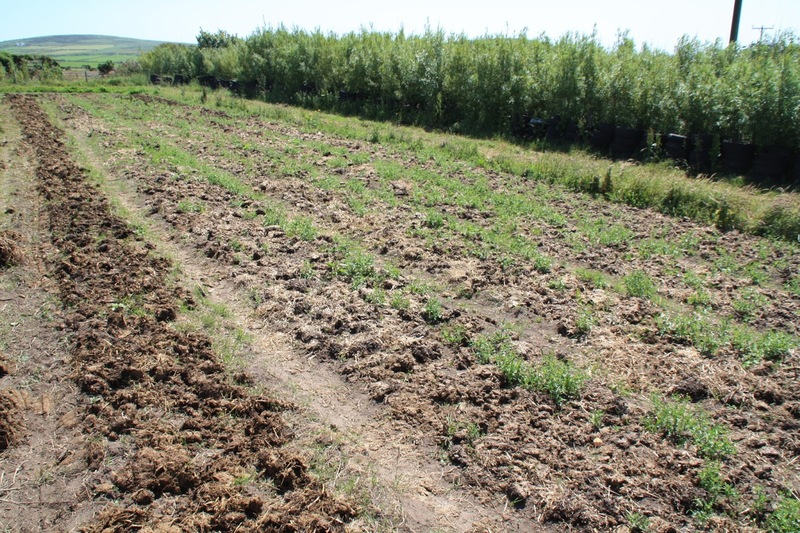 We love it when the new season crops start to become ready for picking and we move out of the hungry gap and into the productive summer. We are now picking our basil, broad beans, climbing French beans, courgettes, cucumbers, the first few tomatoes, strawberries, new potatoes, rainbow chard, salads, borage flowers, carrots and physallis, with more to come. 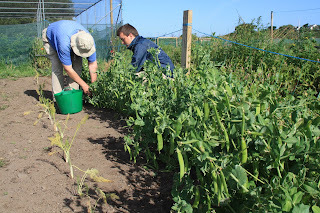 Ian and Pablo picking peas on Thursday morning ready for Friday's veg boxes. 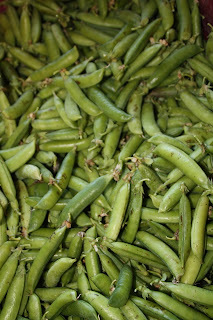 Our first harvest of peas. 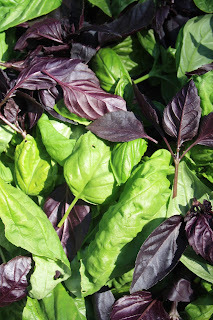 Our first harvest of basil - sweet Genovese, purple, and lettuce-leaved. 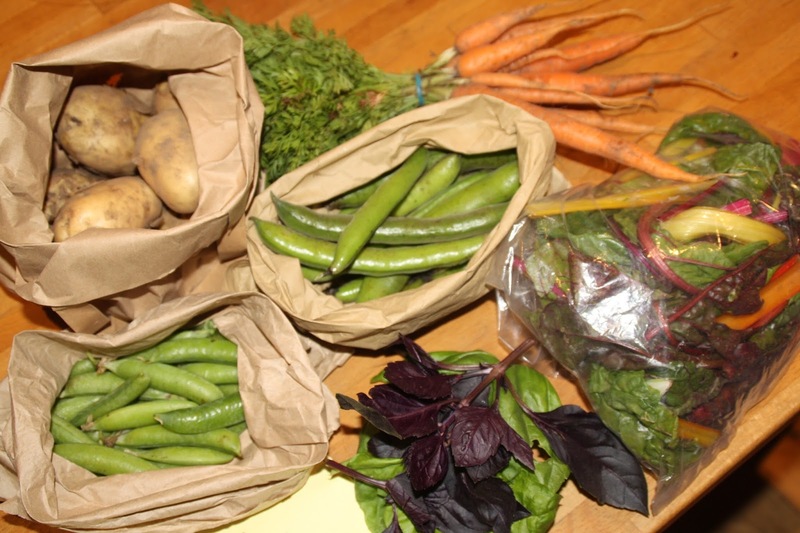 This week's small £6 veg box - new potatoes, broad beans, baby carrots, peas in their pods, rainbow chard, and three types of basil (sweet Genovese, purple, and lettuce-leaved). 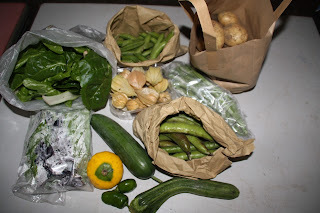 The standard £10 box also included cucumber, courgettes, and mixed salad leaves, plus extra potatoes and basil. All of these veg were grown on the community farm. 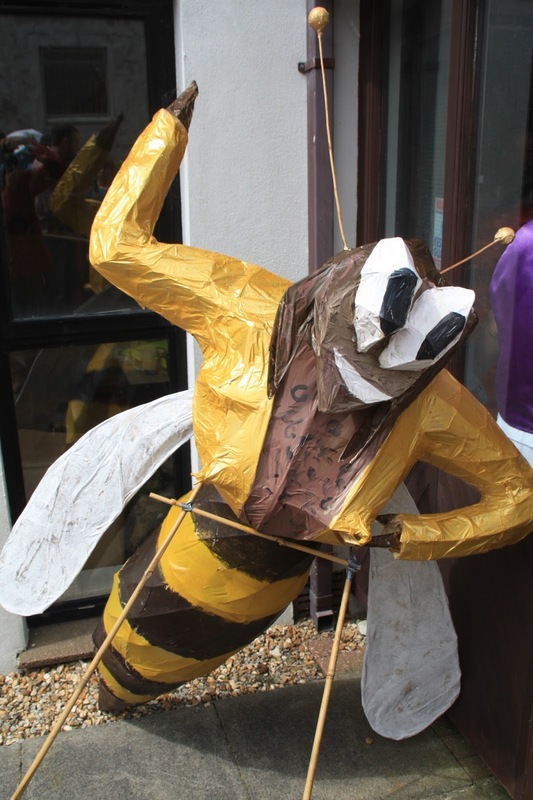 The last weekend in June saw the farms' very first "Introduction to Bee-Keeping" workshop which was run by our very own bee-keeper, Matt Pitt, with funding from "Awards for All" and Councillor Sue James' "Community Chest Fund". This enabled seven people to learn the basics in the classroom and to discover hands-on if bee-keeping is for them. 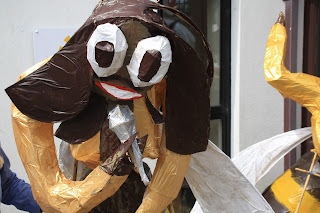 The feedback received after the workshop was brilliant and we are already fully booked for our next one. 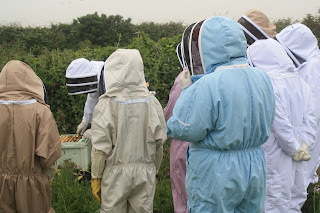 Keep an eye on our Facebook page for further upcoming courses or contact the farm if you are interested in learning the ancient art of bee-keeping! 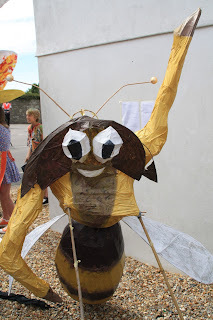 Matt demonstrating out at the bee hives. Shop opening times for the summer. 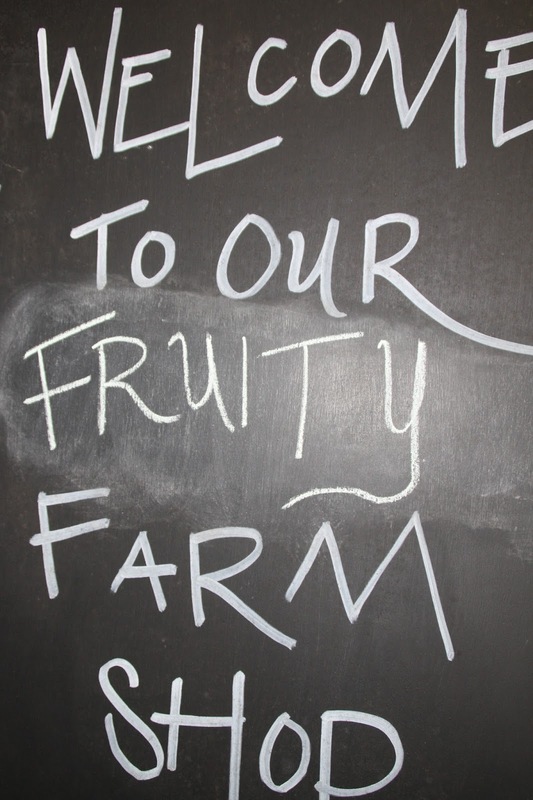 Through July and August the farm shop will be open seven days per week, from 11am till 6pm. 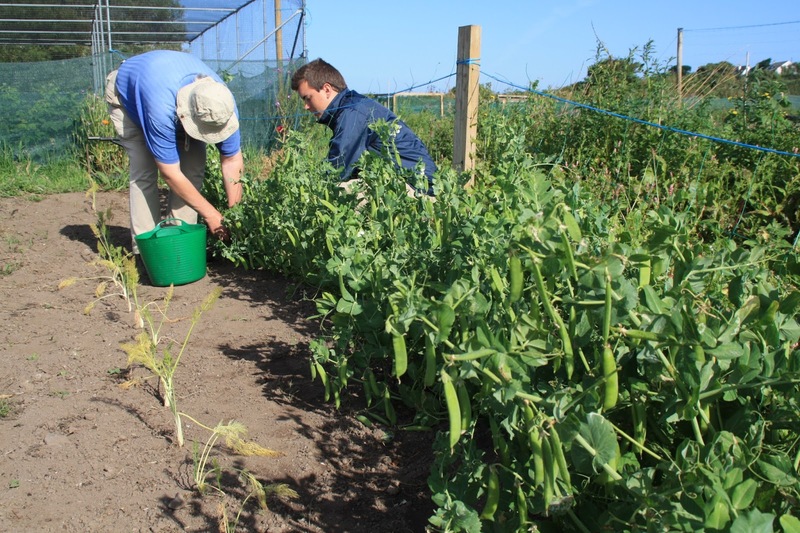 Our summer produce has started to appear on the shelves, including French beans, cucumbers, courgettes, new potatoes and black Tuscan kale, and there will be more to come (peas, tomatoes, carrots etc.). We also stock local milk, fresh bread, our own eggs, local cheeses, plus a range of goods such as raw chocolate (made by our friend Darren in St Just), pulses, chutneys, honey (from our own hives), hand-knitted socks, jams, soap (made by Jean in St Just), leather work, hand-made cards (made by our friend Willow in St Just), Cornish seaweed, pewter bees etc..
We planted just over 140 squash plants out on the market garden on Wednesday 1st July, of 11 different varieties, some tried and tested and some experimental. 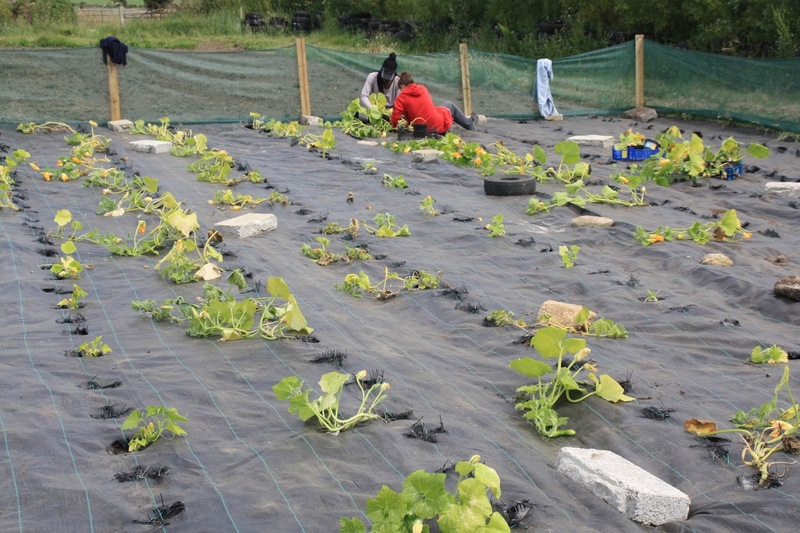 A labour of many hours spread over many weeks, the squash patch covered in dung ready for rotovating. Mipex laid on the ground (salvaged from our destroyed polytunnel, with holes already cut but at tomato vine spacings). Wind mesh erected around the patch. 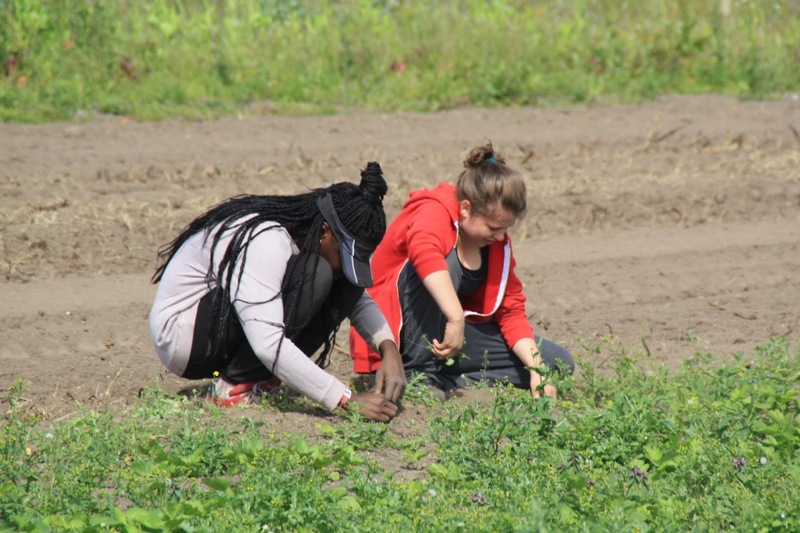 Sarah and Alice planting a squash in every third hole. 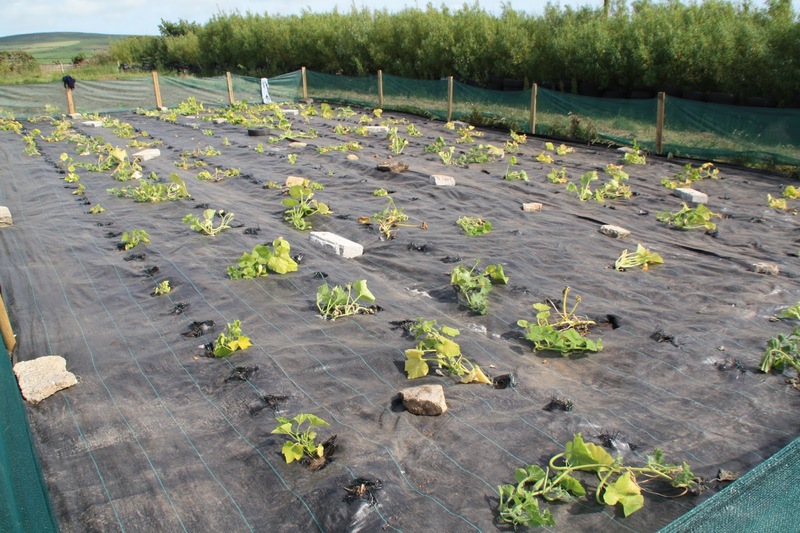 The patch fully planted (including 24 plants that didn't fit inside the mesh, planted next to it along the outside). These are the contents of our "small" veg box from last week (3rd July) - 100g of mixed salad leaves and flowers, 200g of rainbow chard, 500g of broad beans, 1kg of new potatoes, and 2 courgettes. This veg box is shown with optional extras of 1 litre of organic milk from Treen (£1.20), half a dozen of our eggs (£1.50), and a large organic sourdough loaf from Vicky's in Helston (£2.90). The standard £10 veg box had an extra courgette, a cucumber, extra 500g of new potatoes, a bunch of radishes, French beans instead of broad beans, and a globe artichoke (but no salad leaves). Four of our wwoofers have reached the end of their stays on the community farm over the past week - Claudio from Turin, Maxime from France, Pablo from Zaragoza, and Iris from the Netherlands - and we would like to thank them for their hard work and to wish them well on their onward travels. 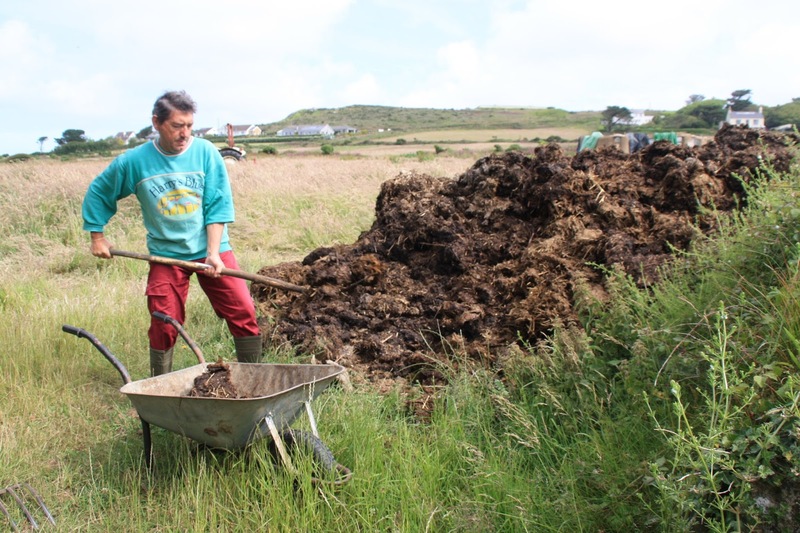 Claudio (the only one not to have already appeared on this blog) seen here loading up with cattle manure to fertilise the squash patch.